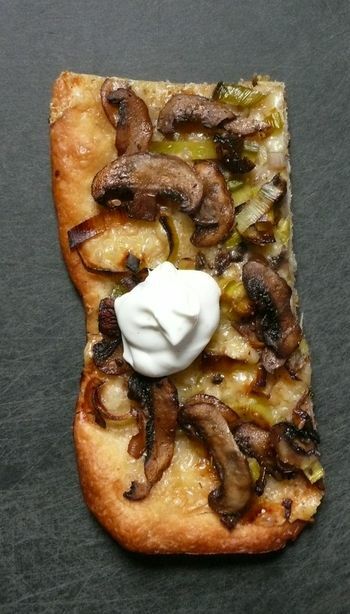 It turns out that a dollop of Greek (style) yogurt on a mushroom pizza will taste about as amazing, and, surprisingly, as similar as a dollop of crème fraiche. At first I was scared that I was eating yogurt that had turned, but sadly, I know what that tastes like and this wasn’t it. This was just a creamy, ever-so-slightly acidic contrast to the richness of Gruyere, leek and mushroom pizza. If you don’t have Greek/Balkan/Mediterranean-style yogurt, you can get the same effect by straining regular yogurt through cheese cloth for 30-45 minutes in the fridge. Just set the cheese cloth in a strainer that’s sitting over a bowl, and use full fat yogurt. I imagine this tastes just as good on soup or other pizzas but we went through most of a container putting way too much of it on this one pizza, not the elegant amount you see in the picture above. I had to shoot it this way because if I showed you how much I actually slathered my slice…you would have a picture of yogurt.